Robotics technology is one of the fastest emerging technologies that have potential to revolutionize the delivery system in various industries. Despite, being in its nascent stage, delivery robots are currently moving mail and supplies around offices, hotels and other large spaces. For instance, company Savioke butler robots can roam around the hotels delivering snacks, toiletries and other requested items. These advanced robots are equipped with artificial intelligence, so that they can interact with customers and provides positive customer experience. In 2015, Savioke's prototype robot fleet travelled more than 1,000 miles in five test hotels. Beside, delivery services in hotels, these robots also deliver medicines, meal and documents in hospitals. Aethon, a U.S based company is known for its delivery robots that are capable working in medical environments. TUG an Aethon's flagship robot, can pull the delivery carts to places where they are needed, capable to access elevators and pathways avoiding pedestrians. The Aethon and Savioke are showcasing the glimpse of coming possibilities in automatic logistic delivery systems. Mobile robots technology will provide the opportunity and allow the researchers to build more efficient delivery robots that can drive on sidewalks and delivering parcel door-to-door. Autonomous Delivery Robots Market is driving on the back of emerging technologies such as IoT (Internet of Things) and artificial intelligence technology. Implementation of artificial intelligence enables the autonomous delivery robots to interact with surrounding environment and to learn from their surroundings as well. Starship Technology, a London based company using AI technology and aims to make autonomous delivery robots more efficient by developing robots that can complete deliveries in congested urban areas. By the end of 2017, dominos has planned to start using fleet of autonomous delivering robots in to deliver pizzas in some parts of Netherlands and Germany. Dominos is teaming up with Starship Technology for the introduction of autonomous robots. Starship Technology teamed up with Postmates an online delivery service provider in U.S, and the autonomous robots are already delivering goods in San Francisco. Autonomous delivery robots are revolutionizing the modern logistics and delivery system, with vast opportunities and growing need of efficient delivery system expected to drive the growth of global delivery robots market. However, autonomous delivery robots have to walk a long road for its successful implementation across the globe. Delivery robots are capable to operate in low density population areas, thus more innovations and efficient infrastructure is needed for successful growth of delivery robots market. Legislation for the adoption of autonomous delivery robots is one of the major hurdles for the growth of global autonomous delivery robots market. Although, some legislation has passed in U.S states such as Virginia, Columbia and several laws are in work in Florida and Idaho. In Germany, autonomous delivery robots need special permission to motor on pavements. On the other hand, it's completely legal in Austria. Challenges regarding the legislation and government regulations are expected to diminish with continuous development of autonomous delivery robots cross the globe. Global robotics market valued USD 35.0 billion in 2015, which is expected to expand at a CAGR of 9.0% over the forecast period i.e. 2016-2024. Autonomous delivery robots just marked their presence in various end-use industries and expected to grow at a CAGR of 14.5% over the forecast period owing to significant adoption rate in Europe and North America. Geographically, Europe region is expected to dominate global autonomous delivery robots market owing to huge expenditures on R&D of delivery robots and rising numbers of startups serving delivery robots market. 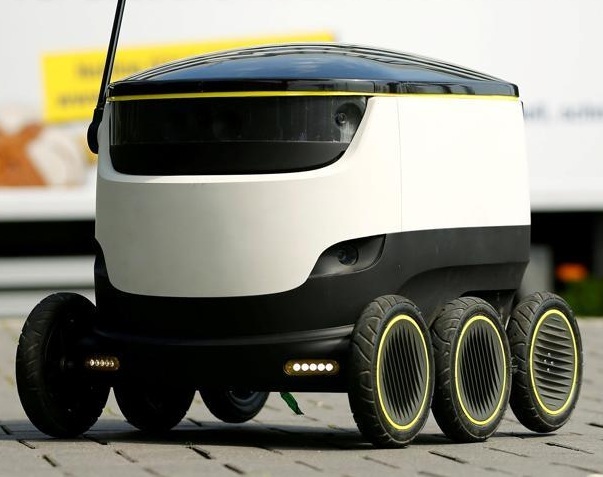 Germany and the United Kingdom are expected to dominate the Europe autonomous delivery robots market closely followed by France and Netherlands. On the other hand, North-America is projected to be fastest growing market majorly driven by the improving regulations and laws for implementation of delivery robots. Moreover, rising adoption of robots by delivery service providers and by local commerce business owners is triggering the growth of global autonomous delivery robots market.